My paternal grandma was married in the United States in the late 1950s. I don’t know the details but I do know the dress. It was white (surprise, surprise), with a fitted bodice, cascading skirt and a dramatic train, all constructed from yards and yards of delicate lace. Her husband matched in a white dinner jacket. The wedding photos are jubilant; their faces joyful. The usual destination for a dress such as hers is the back of the wardrobe –perhaps protected by dust covers – or folded carefully in a tissue-lined trunk. The intricate embroidery or tulle layers might be rediscovered on special occasions, anniversaries perhaps, and one day might be tried on for size by a daughter. Sometimes, as with so many family heirlooms, the precious fabric might be lost or ruined. However, none of these options apply to my grandma. I must start by explaining that she was a Czech refugee. Her family fled the communist invasion of Czechoslovakia in 1948 with little more than the clothes they were wearing. This brutal change of scene, coupled with their experience of WWII, meant that my grandma (or my ‘Babi’ as I call her) was never wasteful. Every scrap of fabric had its home, all leftover food its use. Sadly I never knew my grandfather because he died before they had been married a decade, leaving my ‘Babi’ to bring up those two young sons on her own. She had lost the great love of her life (and it would take her until the age of sixty to find love like that again). She moved to London, taking her clothes and memories with her. Death is not finite. It cannot be fitted neatly into one of many boxes and stored away in the spare room under a pile of coat hangers. Just because more than forty years have passed, it does not mean that the memory of my grandfather has diminished for those who knew him. Instead, her home has come to represent a jumble of times – different lives laid out, one on top of the other, like layers of tissue paper. When my family visit London, to fill the place with noise and the smell of cooking, there are still small reminders. If I go into my dad’s old room and lie down then I can see his scribbled teenage writing on the underside of a shelf. A wedding album sits among other family photos, and it represents the best of times. My grandma has gradually given me many clothes that I consider heirlooms: a red satin evening coat, a couture cocktail dress she bought in an NY thrift store for $20 in the fifties, a seventies blue nylon hooded robe. Each piece arrives with a story attached. The threads that are seamed throughout these garments are like family, stitched together. In seeing and wearing my grandma’s skirt, I am embracing the good and testing times that marriage and life in general brought her – for anyone, these are dresses to have and to hold (and to hold on to). In the first look I added a yellow crocheted top bought from a charity in shop in Bristol (I love all the St Peter's Hospice ones there! ), alongside a white silk sash and shoes from ebay. For the second I styled it with the the same silk sash (in my hair) and a green sixties fringed top from a vintage market. The clutch bag is my mum's and the belt was second hand. The necklace in both shots was for my birthday. Finally, I was extremely happy to be asked to be Motif Mag's covergirl for their latest issue. Do take a look at this free, quarterly, online magazine. ooh you styled it so well! Wow, you are so lucky to have this beautiful skirt! What a smart woman. 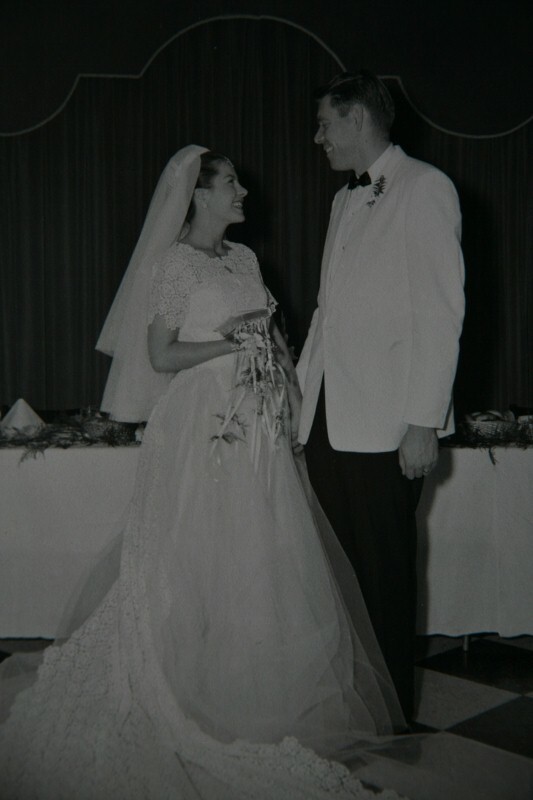 I would love to have a piece made from my grandmother's wedding dress. I absolutely love the second look. The green fringe is amazing. I love it with the green top, such a gorgeous contrast in colour and texture, but both so elegant. It is a real tragedy that many a beautiful wedding dress just gets boxed away after the big event, never to see the light of day for years & years with only the stink of mothballs to keep it company. Your granny was spot on when she decided to make hers into something to be enjoyed beyond her big day & what a beautiful creation too. I have a small collection of wedding dresses that I've picked up from various markets, boot sales & charity shops throughout the years and I often buy them with a revamp thought in mind...haven't quite got passed that revamp thought stage with any of them yet though, too many projects & too little time, that is my problem. You look wonderful as always & your writing always touches me. Congratulations on the cover gig, well deserved, they couldn't ask for a more stunning model. That skirt is quite a beauty. Adore the cascading detail. Your grandmother sounded like a gem, that is so beautiful that you are able to have memories of her from the heirlooms. Not to say that your posts are upsetting, not in the least. They're very inspiring and thought-provoking. I just wish I could share in that same world of love and history. What an amazing story about your grandmother. And how lovely to have you fill these clothes with new memories, weaving your own stories into its seams. I'm sure your Babi will approve of your styling! Of all the clothes in my closet, it is the family heirlooms I treasure the most. When my mom passed away last year, the strangest yet most happily poignant time we spent was when my 2 sisters and I sifted through her belongings. So many happy memories were associated with each garment (even the tattered ones), every piece of jewelry, or accessory. Some items we decided to keep as "shared" property, borrowing from mum's closet the way we always did. Other items, we took home with us, according to the string tethering the garment to our own histories with our mum. absolutely precious story and even more precious skirt! To know that it came from your grandmother's wedding dress; there can't be anything more special than that! Love the white and green combo!! I love reading your blog!! so inspiring !! You are one lucky young lady.Make sure you get all the memoirs from your gran as you can its somethinG i waish I had the chance to do.I adore your wedding skirt and how you have added thoise beautiful tops.Will you show us some more of your heirloms andthe stories and maybe a pic with your gran?I love seeing items with stories. Such a lovely story, I love how most of your clothing is vintage and comes with a personal history. It makes me wish my family did the same. I have a few pieces of jewelry and a camera, your so lucky that your grand mother held on to those amazing pieces. That skirt looks lovely on you, and how amazing that it was once part of your grandmother's wedding dress. That's a really special piece of clothing right there! This brought tears to my eyes. Beautifully written and the styling is beautiful... This inspired me as well. I have my mother's green linen embroidered Afghan long coat I want to try to wear in real life. I love how elegant and yet unique you look in these pieces. It's helping me think of ways to wear the beautiful, old coat! This must be the best blogpost I read in ages. It's interesting, moving, well-written. I love how you combine your styling and writing skills. The combination gives extra strength to both pictures and text. Wow the green fringing is fabulous with the skirt, such a lovely post! Congratulations for the magazine request!!! i'm touched by this story of your grandma. your writing skills are intriguing! fabulous pictures as always and congratulations on making the cover. It's very inspiring to hear these kinds of stories about bold women, and to know that style can be informed beyond mere whims. OMG! I love the skirt, with both shirts!! You have such a great style!! Wonderful Post and what a wonderful story coming with this lovely skirt. Yes, your grandparents look totally happy. I really like the second outfit, because of the green top. The green is fabulous. Thank you so much for your very nice comment the other day, it made my day. this dress remids me of the satin heap in my attic- i know exactly what you mean when you talk about the memories and stories behind clothes. Such a touching post. You're right; clothes are so much more than just thread and textile. Wow....that beautiful skirt actually came out of your grandma's wedding gown??? That fringed top is a lovely color! That is such an incredible story. Beautiful pictures of you too, but also your grandparents wedding day. You must really treasure those garments! I'm going to Bristol in a few weeks and I'll make sure to take a look at their charity shops! You are so fantastic in putting graments togheter! I love the combination of green feather top and white lace skirt! Your posts are always so fascinating. I love the family history you reveal. It's also a wonderful idea for my wedding in the future. I've always thought it sad to get a dress you only wear once and hoped to get something than can be reworn. This dress has such a beautiful story and it is so nice wearing clothes that have a special meaning. I love how you styled it with the green top. Absolutely beautiful. I love how you styled it two different ways. You have such a great blog. Gorgeous skirt! Love both looks! I know exactly what you mean about the reusing of wedding dresses! My Grandma did the same thing...twice! Her first dress was kept as an evening gown but with the sleeves taken out and the neckline slightly changed, and was used in many a theatrical production! The second dress was completely cut up and reused...so much so, that all we have now are a few scraps! My Mum also dyed her wedding dress so it was more useful! I think it's lovely to have things with stories attached, and I feel a lot more attached to things Grandma has given me than to things I can buy. They are irreplaceable. i had tears in my eyes reading this. and the sweet photo at the end- what a handsome couple they were! you are blessed to have inherited many beloved garments from your grandmother. i can tell you treasure each one. and congratulations on the motif mag cover! you styled it perfectly... i love the story behind the skirt. First of all, thank you for responding to my comment on your Penguins Books post. I really appreciate that you took the time to do so. Your grandmother must be a very inspiring woman. Her sense of resourcefulness reminds me of my own grandmother who fled from East Germany leaving behind all of her family - unfortunately, that sense is something that our society (including me) has almost forgotten about. The story behind that skirt is beautiful - and so is the garment. I especially love the way you styled it in the second outfit. What a fantastic story with a fantastic couple behind it... they look so happy in the wedding photo! Your Babi must be an extraordinary woman. Also with an extraordinary wardrobe! Thank you for sharing her story!